I’m beginning to think the Universe played at little joke on me. Back in 2005, when I tearfully concluded that my right livelihood could no longer be found within the craft show world, I thought the Universe gave me the answer to what was supposed to come next. In retrospect, it seemed like the Mother Superior moment in “The Sound of Music,” the moment she advised Maria, “When God closes a door, he opens a window.” Cue “Climb Every Mountain.” My own window seemed to open, with or without divine intervention, in a Stockholm cafe. I thought the message was clear: the mountain I had to climb was getting a masters degree, in mediation. 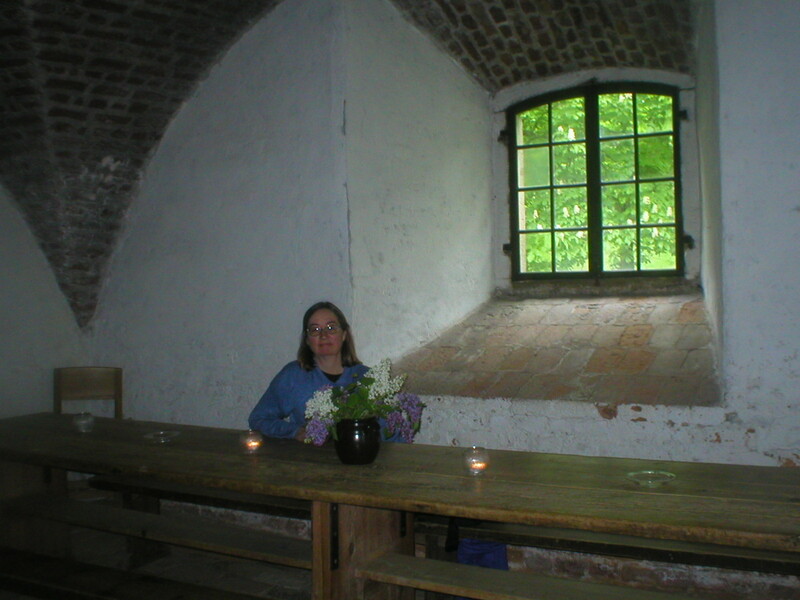 Pondering my future in Sweden in 2005. I had flown to Sweden just days after a disastrous craft show experience, a show that led me to sob in the bathroom and promise the heavens above that I was definitely closing the craft show door. Lucky for me, my trip to Stockholm to visit dear friends Bert and Keith was already arranged. It was great to get away, and they were attentive hosts. One day they both had to work, so I was on my own. I ended up touring the Nobel Museum, an incredibly cool and deeply inspiring institution. Afterwords, alone in the cafe, I heard the the word “mediator” jump into my head. Seriously, that’s what it felt like — the word jumped into my head and I immediately knew that’s what I was supposed to do next. As soon as I got home, I contacted the admissions office at Woodbury College (now part of Champlain College) and signed up to begin their brand new Master’s program. I knew so little about formal mediation that I somehow hoped I could be a mediator without dealing with conflict — in hindsight, a wildly silly misunderstanding of what I was getting into. Mediation is all about stepping calmly into the eye of the conflict storm. Ultimately, I learned to do just that, but personal conflict still distresses me. None of this is as flaky as it may sound. Mediation in many ways suits my personality, talents, and what I was looking for professionally at that time. I wanted to help heal the world in some way, and mediation allowed me to use my communications skills to create at least a little more peace, a little more happiness. I hadn’t yet taken the VIA strengths survey, but now I know my signature strengths can be valuable to both the mediation process and to establishing rapport with parties in a conflict: the ability to forgive, emotional intelligence, and the capacity to give and receive love. Indeed, I was good enough to be asked even before I graduated to coach new mediation students at Woodbury, and have continued working with the program ever since. I also created the position of Staff Mediator at Home Share Now, and took on various freelance mediation and facilitation gigs with some professional and personal satisfaction. Given that healthy relationships are the number one predictor of happiness, helping folks resolve their conflicts more successfully is clearly a job that brings more happiness into the world. And yet … lately I’ve been wondering, perhaps the Universe was really saying, “Meditation.” What if I misheard? Okay, I’m not that woo-woo. The two words sound so much alike, I often trip up and use the wrong one. The idea that I may have misheard makes me laugh. And, the truth is, almost as soon as I finished my master’s degree — culminating with a Capstone study on “Mediation and Suffering” — I picked up Dan Gilbert’s Stumbling on Happiness followed soon after by Eric Weiner’s The Geography of Bliss. I didn’t know it yet, but I was already following a different career path. Of course, productive conflict resolution is a HUGE part of individual and societal happiness. And I learned lots of great skills to use both in my personal life and in all my work efforts. I highly recommend the Champlain program, and the gifted teachers there. Mediation is most definitely a happiness path, a right livelihood to build greater well being on every level. But I don’t think it’s my path. Teaching, coaching, advocating, and writing about the whys and hows of both personal and systemic well being — including meditation — that’s my path. So what does all this have to do with anybody else’s happiness? Both mediation and meditation are extremely good for happiness — yours, mine, and ours — in so many ways, both internally and externally. As I write this, I am struck by how much both practices rely on deep heart felt mindfulness, and especially listening — to the said, to the unsaid, to what really matters. I am fortunate that both have been part of my happy life. So the question is, what is your right livelihood, your vocational path to happiness? Perhaps you are already well ensconced in your own colorful and joyful crossroads between your talents and the world’s needs (of which, lord knows, there are plenty!). If not, perhaps you too can go to the Nobel Museum and sit in a Swedish cafe to hear what the Universe wants to tell you. Or at the least, you can meditate on it. Bob and I, freshly married, November 1970. As I recall, the girl sitting next to me in home-economics class was named Diane. She was a cheery sort, and we chatted amiably while working on our sewing projects. I was making a pair of identical paisley print bolero vests. One was for me, I explained, and one was for Bobby Sassaman, the love of my as-yet-very-young life. “You like him? ?” she almost gasped in disbelief. Clearly, Diane did not see Bobby as acceptable boyfriend material. 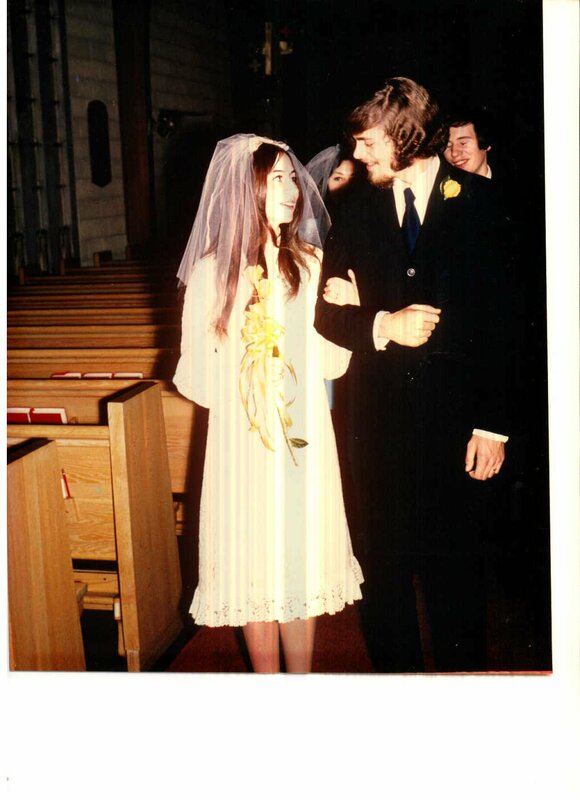 I saw way more than boyfriend potential: later this month, we’ll celebrate our 44th wedding anniversary. We still have the vests. To be clear, when we got married, I believe a majority in the church — including me — were sure the marriage was doomed. I was a pregnant high school senior, barely 17 years-old. Bobby was enrolled at the local community college, but he was still just a paper boy. Neither one of us had driver’s licenses, much less a car. I was fired from my part time job as a short order cook because pregnant teenagers didn’t fit the restaurant’s family fun image. Not too promising, right? I mean, I was crazy in love, but I wasn’t stupid. Yet, here we are. Still crazy in love. Nobody’s betting against our relationship anymore, especially not me. 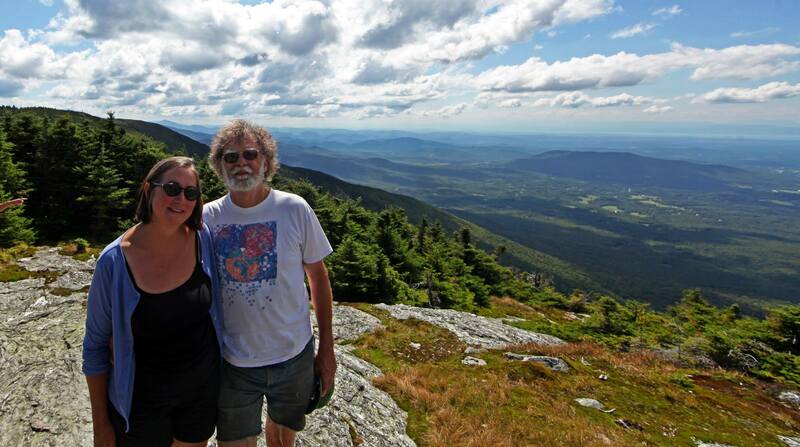 44 years later, on top of the world, Mt. Mansfield, Vermont. Perhaps that’s because the odds were in our favor all along. Recently, I asked Bob (the extra syllable disappeared a long time ago) to take the VIA Institute on Character free online survey. I’ve taken the “test” a few times, and used it in workshops, so I have a good idea of my top strengths. I was curious about his, and one Sunday night he announced his results. Turns out, we have the same signature strength: the capacity to give and receive love. The fact that humor is also tops for him, and forgiveness is number two for me, doesn’t hurt either when it comes to maintaining a thriving relationship for the long term. Okay, there are many other factors that helped us along the way, including the love and support of our families. Still, I was really struck by our common survey result. Is this one of those silly Facebook quizzes? Well, no. Nor is it from a magazine like “Cosmopolitan” or “Redbook” (are they still around?). The VIA index stems from solid research. According to “VIA Character Strengths – Research and Practice: The First 10 Years” by Ryan M. Niemiec, Psy.D., the index of 24 universally admired virtues and strengths “emerged from several scientific meetings led by Martin E. P. Seligman and rigorous historical analysis led by Christopher Peterson, who collaborated with 53 other leading scientists over a period of three years.” This is serious stuff! I initially learned about the VIA index in 2010, at my first ever positive psychology training led by Dr. Lynn Johnson. Dr. Johnson shared the VIA list with us, and I now share it with you: 1) Creativity, 2) Curiosity, 3) Love of learning, 4) Wisdom/perspective, 5) Open-mindedness, 6) Bravery, 7) Persistence, 8) Integrity, 9) Vitality, 10) Give & receive love, 11) Kindness, 12) Social intelligence, 13) Citizenship, 14) Fairness, 15) Leadership, 16) Forgiveness, 17) Modesty/humility, 18) Prudence, 19) Self-regulation, 20) Appreciation of excellence & beauty, 21) Gratitude, 22) Hope, 23) Humor, and 24) Spirituality. You may glance at the list and immediately have a sense of your strengths, but, if you take the online test at the VIA site, you can learn so much more! Plus, there’s lots of information about these strengths and how real people have applied them to lead happier, more fulfilling lives. Here’s the best part about the VIA online test: everybody has signature strengths! Everybody is a winner! Go ahead, take the test, find out how wonderful you are! First, the VIA index does not cover all my strengths, or yours. I know, for example, that I have a facility for painting with watercolors. Apparently, I also have very flexible shoulders. Which is to say, we all have many gifts to share with the world and make our own lives more enjoyable. After you get your VIA list figured out, dig a little deeper. What else makes you wonderful? Strengths and Virtues can present in different ways. Take bravery, for example. A few summers ago, on a vacation trip with Bob, my sister Kathy, and her husband Rick, we climbed a waterfall trail in the wild woods of Maine. While Rick clambored to the top of rocks overhanging a steep waterfall drop, I found a rock far, far away from the edge to sit on. I couldn’t even look at Rick. I was terrified. When he was finally safe and we were walking down the hill, Rick remarked on many of the emotional risks I have taken, risks that would have terrified him. Point taken. Bravery wears many faces. Don’t overuse your strengths. Tal Ben-Shahar, the primary teacher in the Kripalu program, sometimes talks about the “Lasagne Principle.” In short, he loves lasagne, but if he ate it at every meal, the lasagne would be significantly less appealing. Just as our diets are diverse, so too are our strengths and virtues. Love is not, in fact, all I need. Remember your weaknesses. While our strengths deserve top billing, paying an appropriate level of attention to our weaknesses is also a good idea. Case in point: for some reason, I am challenged in getting dates and times right. Twice, I showed up as a weekend guest in a friend’s house a week early. Once I took my kids to a road show of “The Sound of Music,” also a week early. Fortunately, there are these wonderful items now called “calendars.” It’s taken me a few years, but I have finally learned to write down appointments and also to regularly check what’s in there! As mentioned above, the VIA index is a serious topic for research and discussion among eminent leaders in the positive psychology field — but it can also be fun! Nancy K, one of the TA’s in the Kripalu program, demonstrated that in grand style when she posted her list of 24 music videos, one for each of the virtues and strengths. She invited the rest of us to consider what music videos we might choose for our own signature strengths video. Lord knows, there are a lot of love songs out there, but most of them are focused on romantic love between partners. The capacity to give and receive love that Bob and I share is broader than that. Yes, we love each other — and, we each love many others. So even though love is not all I need, let me close this blog the way I began — with love. And the Beatles amazing song, “Love Is All You Need” .